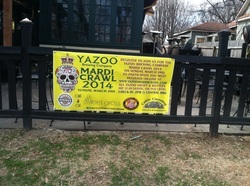 Yazoo Brewing Company of Nashville is hosting a Mardi Gras pub crawl in Cooper-Young starting at 2 p.m. Sunday, March 2, to coincide with the release of its new seasonal beer, Spring Helles Bock. "We thought the pub crawl would be a great way to promote our new beer around," said Ivan Chester, the West Tennessee Yazoo Brewing Company representative. "The hype for it has been great in other cities." Known as the "Mardi Crawl," the event started Feb. 26 in Gulfport, Miss., and is making its way to Nashville with stops in Hattiesburg, Miss. ; Jackson, Miss. ; Starkville, Miss. ; Memphis and Knoxville. Chester said the brewing company is testing the waters with this promotion of the new beer, but it may make this an annual event. He said the brewing company does different pub crawls throughout the year to promote Yazoo beer. The Memphis pub crawl on March 2 starts at Central BBQ at 2249 Central Ave. and ends at Young Avenue Deli at 2119 Young Ave. with stops at Celtic Crossing (903 S Cooper St.), Sweet Grass (937 S Cooper St.), Sweet Grass Next Door (937 S Cooper St.) and Café Ole (959 S Cooper St) in between. "We chose Cooper-Young because it is a walkable neighborhood," Chester said. "Plus, all the bars there have Yazoo on tap or available." The first 100 people who RSVP online and check in receive a free Yazoo Mardi Crawl T-shirt. According to Rod Suess, manager at Young Avenue Deli, Yazoo does a great job of giving away items to attendees. "They will be giving away beers, beads, food, shirts, hoodies, glassware and koozies," Suess said. "They do an awesome job of promoting themselves." Chester said Ole Smoky Moonshine, which is also sponsoring the event, will give away prizes as well. "They will have shirts and stainless steel glasses and shot glasses to give away as well as some other items," Chester said. Suess said at least 100 people are expected be in attendance but that he has heard figures higher than that. "I've heard around 200 people, but I expect more," Suess said. "Everyone loves a good pub crawl. And Yazoo does a great job promoting events, so there should be lots of people." The event is free to attend and registration begins at 2 p.m. at Central BBQ with the final stop at Young Avenue Deli at 6:30 p.m.
"Everyone should have a valid ID and bring cash," Suess said. "It will go a lot smoother and quicker if people pay with cash."